(VEN) - In an interview with Vietnam Economic News, representatives of US businesses shared ideas of Vietnam’s lure, and positive growth, as well as their success in different industries and future plans in the country. Jonathan L. Moreno, General Director, Medovations Vietnam Co., Ltd.
Medovations Vietnam (formerly Sandhill Scientic Vietnam) is a wholly-owned SME manufacturing subsidiary, representing a US advanced technology investment in Vietnam. Medovations Vietnam is both a FDA and ISO 13485 registered operation manufacturing In-Vitro and In-Vivo medical devices. In addition to providing products for its parent and sister companies, Medovations Vietnam provides medical device contract manufacturing services for select other companies. At Medovations, we are committed to the highest standards of quality. We provide a quality product through a continuous commitment to quality, customer service, and customer satisfaction. We use the finest materials, along with both controlled processes and environment for consistent and reliable products. Our staff are keenly aware that our products affect patient health and diagnostics; therefore, we operate with focused diligence. 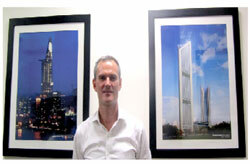 We have operated in Vietnam for over 4.5 years. The country should be high on the list of consideration of foreign investors, including U.S. With the steady increase of qualified labor, improving infrastructure, and the government’s support for FDI companies, we really feel positive about our future here. That is the reason why we are expanding our investment in Binh Duong province with an additional factory under scaled renovation. The local government in Binh Duong, along with our excellent industrial park, has been outstanding partners and gave us confidence in the stability of our investment in Vietnam. I have been a part of establishing this investment from the first day and have witnessed the business climate significantly improve during these nearly five years. Before making the decision to come to Vietnam, we surveyed many countries. We compared many factors related to manufacturing such as: labor cost, purchasing power of the USD, infrastructure, and country stability. We do not regret the decision. Fortunately, our company has a great local management team, who have worked with us from the early days. 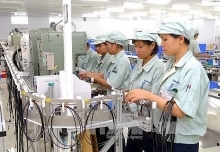 Stable and productive human resources are a strength to ensure long term success in Vietnam. Vietnamese staff are hard-working and eager to learn. We are very proud our team. Having reached success as an advanced technology company, we believe that we are contributing to both the economic and social development of Vietnam. Moving forward, Medovations will enhance its Vietnamese engineering capabilities and ensure that this operation is just as productive as our sister factories in the United States. I am optimistic about Vietnam’s future. I believe there will be an increase in U.S companies investing in Vietnam in the years to come, especially after TPP is concluded. Hopefully, the new trend of investment will include qualified SMEs companies, which can become additional models for local Vietnamese companies to join the supporting the supply chain. Vietnam is very competitive in comparison with the other countries in the region. It is important to continue enhancing the transparency, predictability, and reliability of systems related to trade facilitation to effectively attract more U.S businesses. I believe if new US investors are patient, they will enjoy success here as well. Turner is a North America-based, international construction services company and is a leading builder in perse market segments. The company has earned recognition for undertaking large, complex projects, fostering innovation, embracing emerging technologies, and making a difference for their clients, employees and community. Turner has operated in 60 countries since 1965, functioning on an agency project/construction management or consultancy basis. With a staff of 5,200 employees who work on more than 1,500 projects each year, we offer clients the accessibility and support of a local firm with the stability and resources of a multi-national organization. Turner established a presence in Vietnam in 2006 in Ho Chi Minh City and has continued its Vietnam operations with notable projects in Hanoi and Ho Chi Minh City. In Vietnam, we offer services for project and construction management such as: design management, planning, procurement management, cost management, quality management and safety management. After operating in Vietnam for 10 years, we’ve seen the growth and maturation of the market. There are more high rise buildings and large, complex projects under construction or in the planning stages and this gives us the opportunity to expand our business. As a reputable US company, we are proud of having finished many large and well-known projects in Vietnam such as Bitexco Financial Tower, Pullman Saigon Centre, and the JW Marriott Hanoi. We look forward to the completion of the VietinBank Headquarters in Hanoi and the start of the Springlight City project. We are proud of our accomplishments but the key to our future success in Vietnam will be our Vietnamese staff. Through staff development programs, Turner University – our internal online training programs – and by working side by side with experienced Turner expatriate staff, we have highly qualified Vietnamese staff who deliver projects to our clients. The economic slowdown affected Vietnam’s real estate market but we’re seeing positive signs of a recovery and the government’s recent action to reduce restrictions on foreign investment capital for businesses and to allow foreign ownership of real estate should entice more U.S companies to invest and do business in Vietnam in the years to come. Today ON Semiconductor has an industry-leading cost structure, above industry revenue growth and increasing shareholder returns. Our corporate strategies call for the continued alignment of resources and investments to win in our strategic growth markets – specifically in Automotive, Wireless Devices, High Performance Power Conversion, Motor Control and Industrial Internet of Things (IoT). Our Vietnam operations fit squarely into this corporate strategy. The automotive industrial and white good devices produced in our Vietnam facilities help feed the company’s key growth markets. As with every country where ON Semiconductor operates, our factory teams here in Vietnam have steadily improved operational efficiency, output and the quality of our products to exceed our customer expectations. Over the years, we have found that the Vietnam government has gained a stronger understanding of our fast-paced global business which has led to some improvement and collaboration. Our high tech customer base requires continued improvement and we need the support of the local government so we can better meet our customer expectations for responsive supply to their changing needs. High quality is the key to being successful in our industry. Maintaining quality is heavily dependent on having employees that are well trained, technically capable, and have a willingness to continuously improve. The inpiduals that make up our employee teams in Vietnam are very important to us and essential to our growth and success. Overall, the teams here are eager to learn, dedicated, dependable, hardworking and able to expand their skill sets. To help ensure a workforce with the progressive skills needed for our current and future operations in Vietnam, ON Semiconductor has established targeted programs that provide technical training and multi-national business training on supply chain, quality, logistics and many more disciplines. Specifically, we train and develop our entire labor force to be a preeminent, high quality semiconductor supplier with ISO 9001 and TS16949 Automotive quality standards. Focused training programs are offered to our more than 400 engineers, technicians, and university-level support staff here in Vietnam. We are always assessing where we want to grow our capacity, and with a strong presence in Vietnam it will always be considered. Kimberly-Clark is a global leader in “Essentials for a better life”, and our global brands are a trusted part of the lives of nearly one-quarter of the world’s population in more than 175 countries. For more than a century, we have transformed ideas into innovative products. In Vietnam, Kimberly-Clark proudly markets and manufactures leading brands such as Kotex® and Huggies® in the sanitary napkins and baby diaper categories. We have localized our Huggies production in 2011 in Binh Duong, Vietnam. We have been extremely happy with the infrastructure and talent available. We have secured land rights in the Vietnam-Singapore Industrial Park extension II for future expansion. Our Binh Duong mill has one of the best operational efficiency and waste levels across the World. We are not only manufacturing but also exporting from Vietnam to other developed markets across Asia Pacific because we believe Vietnam can produce the quality even for the most discerning consumers. We also have a strong distribution system. With more then 90 million people, Vietnam is really a huge market for us. We always put the consumer in the front and center of everything we do. We believe in a local empowered model where we customize consumer - preferred innovative solutions for Vietnamese Mums and Ladies with our Huggies and Kotex brands. We see a lot of advantages here with good labor market, attractive cost structure and convenient logistics. At Kimberly-Clark, we focus on attracting and training highly-qualified talent that can help sustain and grow our business in Vietnam. Over time, we would like to offer our Vietnamese talent regional and global opportunities. We now have a couple of Vietnamese working in our Singapore offices. In the next few years, we still feel positive about the growth prospects of the Vietnam market. Our business is still growing although the market has been slowing down. Vietnam’s economic growth combined with its pro-growth policies, continues to encourage us to invest. We have plans to invest in additional capacity in 2017-18. For Kimberly-Clark, sustainable growth includes innovating brands, increasing consumer-centric approach, contributing to the community and developing Vietnamese talent. Global CyberSoft (GCS) is a leading global IT solutions provider founded in California in July 2000, Global CyberSoft’s equity is currently provided by institutional investors such as Stone Apple. With extensive experiences and rich expertise, Global CyberSoft poses to be a major IT pioneer and trusted partner in Vietnam. GCS now employs more than 900 highly skilled professional engineers, all dedicated to supplying total solutions and outsourcing services for valued local and global clients. 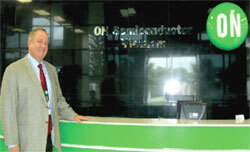 In 2007, GCS moved the Global Development Center to Quang Trung Software City, Vietnam. Global CyberSoft offers a wide range of services including IT outsourcing, end-to-end IT services and systems integration for domestic and foreign businesses. Our expertise and experience span over various industrial segments and domains, including but not limited to Manufacturing, Retail/ Trading/ Distribution, Logistics, High-Tech/Mobile, and Services industries. In 2014, GCS became a Hitachi Consulting Company. For GCS, Vietnam is an emerging destination for IT service industry. Although Vietnam economy is facing many difficulties in the recent years, IT industry especially in Information Technology Outsourcing (ITO) and Business Process Outsourcing (BPO) are still in an impressive development. According to the latest report by Tholons 2015 - the leading international organization specializing in ranking outsourcing destinations, Ho Chi Minh City (ranked No. 18) and Hanoi (ranked No. 20) are among the top 100 leading ITO destinations. Also, according to the latest report by Cushman & Wakefield (C&W) in 2015, Vietnam ranked No. 1 among the attractive destinations for BPO services on worldwide in the first time. Quality of Vietnamese labor market has been developing. At GCS, human capital is the key for our growth. With the help of Hitachi Consulting, GCS will not only develop human resources but also offer wide range of consulting services to GCS’s customers. Clients, therefore, will receive more valuable added values. We continue to invest in human resources through the Training Center and competitive advantages mentioned above. The Training Center receives 100-200 trainees a year, including fresh graduates and senior students. After practical training lasting from three to six months, 80-90 percent of these engineers are ready for real work. For the years to come, GCS will expand the business in Vietnam with new endeavors to meet the persified demands of our clients.